I once owned a James Wharram Hina 22 catamaran and I can assure you the accommodation was pretty sparse. She was named, ‘Twinstar’, but members of my local sailing club named her ‘Twin Coffins’, perhaps not without reason, because there was just enough room in each hull for a person lie down, and she was rather boxlike. Fortunately she never became my coffin, despite capsizing her. (See link below.) The fact that I can speak from personal experience about the very limited accommodation of my Hina, enables me to fully comprehend the minimal space aboard Rory McDougall’s ‘Cooking Fat’. She is a Wharram Tiki 21 which is very similar to my Hina 22, except her decks are flush with the top of her gunwales and she has raised cabins, which provide more volume within her hulls. Now, Rory McDougall is a legend. He sailed around the world in his diminutive catamaran which he named ‘Cooking Fat’. 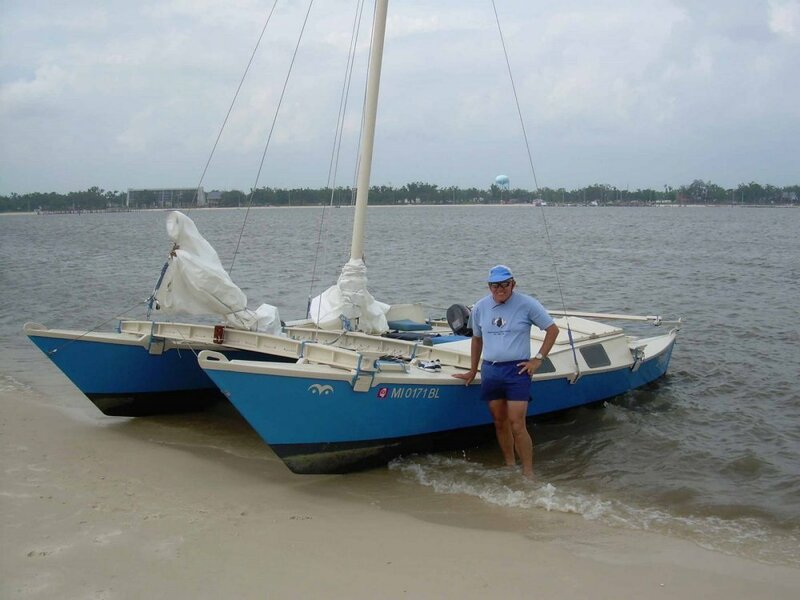 As far as I know, Rory still holds the record for sailing the smallest multihull around the Globe. Googling the Internet does not throw much light on his incredible adventure, but what has drawn my attention to this sailor is his entry in the Jester Challenge 2010 Transatlantic Race. He will be a star attraction for spectators as they watch the start of the race on Sunday, 23rd May at 1300. This Race will have a start line beyond the western end of the Plymouth Sound Breakwater. Spectators will have to look hard to find ‘Cooking Fat’ among the other 89 starters. 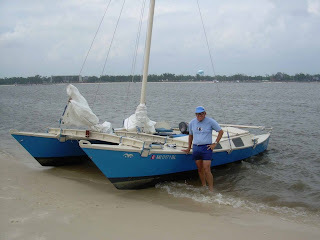 Rory built his own boat and did his circumnavigation in two stages: The outward leg was from Dartmouth to New Zealand between 1991 and 1992; then after a break of four years he sailed the catamaran back to the UK, arriving at Dartmouth in August, 1997. He was brought up with his sea-loving parents, and he first caught the sailing bug when he accompanied them across the Atlantic at the tender age of 13. This resourceful sailor enlisted the help of crews for some stages of his circumnavigation, most of which was done without an engine, but he needed the help of an outboard motor when he battled up the Red Sea on the return voyage and along the Suez Canal. He has had several different marine related jobs, including running a day sailing business and doing marine surveys in Belize, being employed with a charter fleet in Australia, and being an Assistant Manager of Moorings Charters at St. Martin in the Caribbean. I had the pleasure of sailing with Rory in Belize for an afternoon. He was one of the nicest people I've ever met and as you might imagine, he had a clarity and calmness to his demeanor that must only come from facing the worlds oceans, alone on little more than a raft. I admire him greatly. I wish he would write a book. Anyway I am honoured to have sailed with Rory as he is an unsung adventurer.